Cold weather clothing for our dogs is important. We want to keep our dogs as warm and dry and as comfortable as we want our bodies in the colder months of the year. Sometimes we get creative when dressing our dogs. We try out an old sweater or shirt of our own we believe might fit our pet better than the last dog sweater we bought. Last week when cold wet weather nipped at our paws, I took an old sweatshirt of mine, trimmed the sleeves a bit, and had my dog Valentino try it on for size. 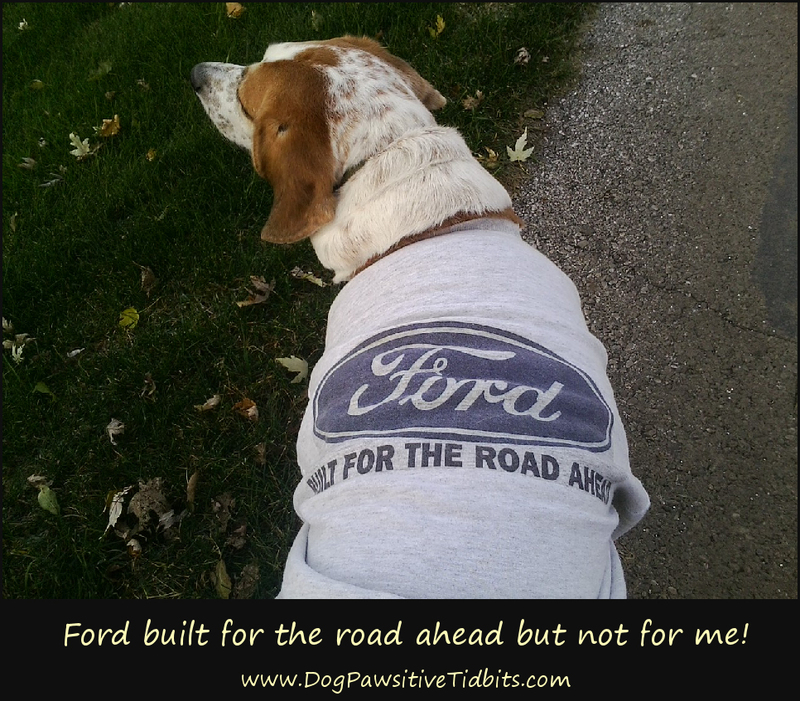 While the Ford phrase on the back of my shirt says it's built for the road ahead, my dog Valentino barks, "But it's not built for me!" While my hand-me-down-to-the-dog shirt seemingly protected Valentino from the windy cold of late Fall, he wasn't comfortable at all! He walked as if in restraints, even though the sweatshirt seemed roomy enough. When his favorite critters to chase came into view, Valentino would pick up the pace for a few steps then come to a halt. He'd just stand there and give me his hound dog whine. Undoubtedly he felt there was no way he could chase a stray cat in a getup like that! 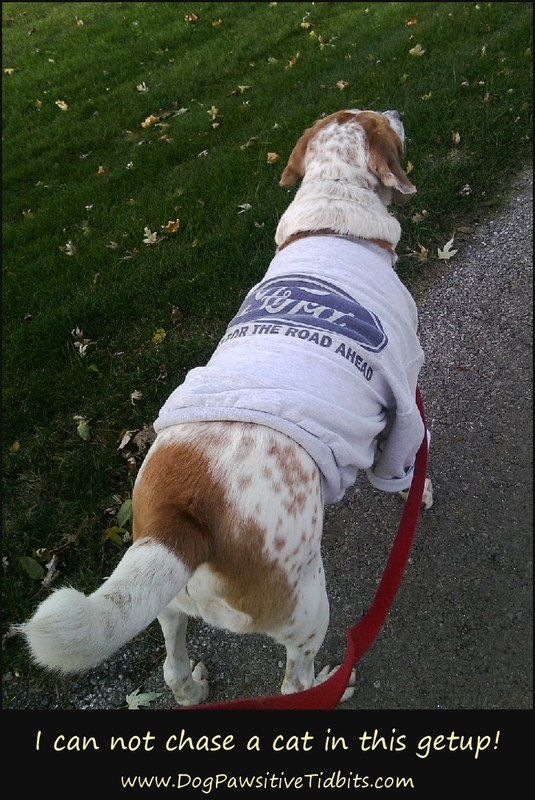 Clearly, my human sweatshirt was not intended for my dog. 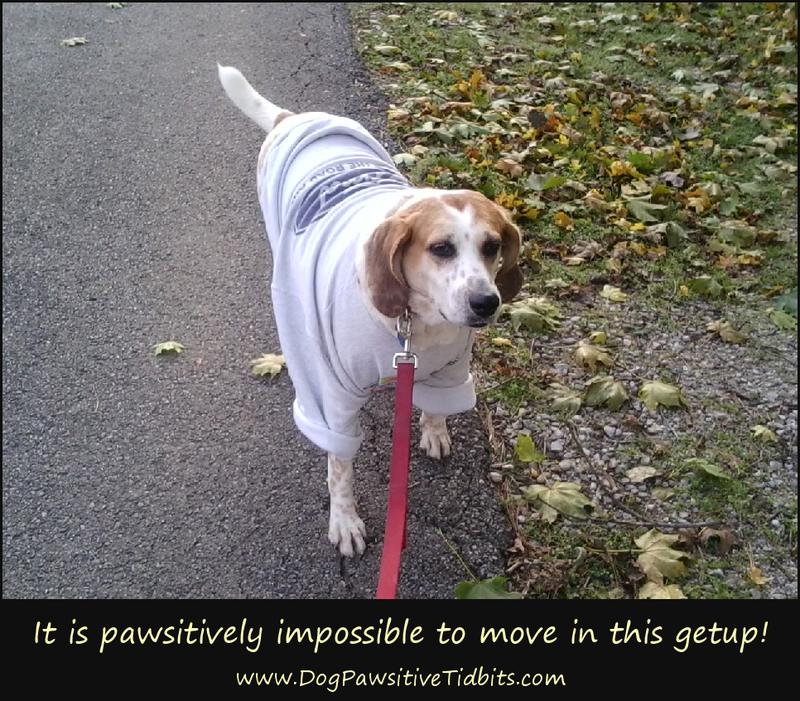 He walked as if it were pawsitively impossible to move along. Obviously, my DIY human-to-dog shirt was a complete failure. While walking the neighborhood, my dog Valentino kept looking around as if to say, "If anyone sees me in this getup I am sure to die!" 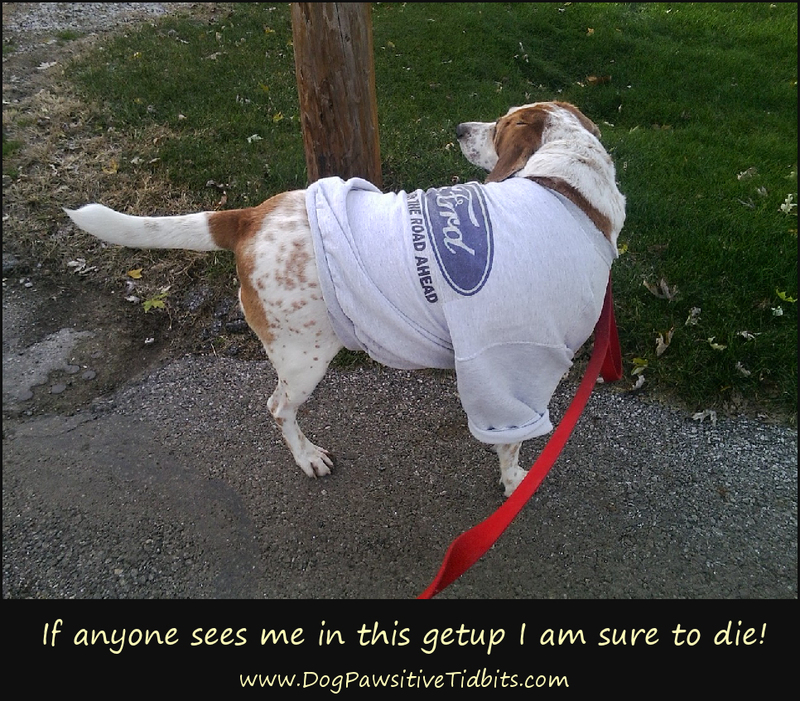 My dog had difficulty taking care of business—I had to move the shirt away from his private parts for him to do so. He was clearly not impressed. And yes, I saved Valentino the embarrassment of capturing that chaos on camera! Sure, my dog has a perfectly fine red sweater for keeping him warm during the winter season. Still, with rainy days and wet winter white flakes headed our way he has nothing to wear which will also keep him dry. My dog Valentino needs a raincoat! Preferably one that will also keep him warm while keeping him dry. Thanks to a fellow writer and her dog I feel I found the perfect cold and wet weather coat for my dog. Yes! I window shopped online and it was her purchase for her dog that made my final decision easier. I ordered Valentino a coat. It arrived today while I was at work. My dog and I will put it to the test this weekend! Ruth Cox is a participant in the Amazon Services LLC Associates Program, an affiliate advertising program designed to provide a means for sites to earn advertising fees by advertising and linking to Amazon. Be sure to follow this Dog Pawsitive Tidbits blog to read all about it when my dog Valentino takes his first stroll in the neighborhood with his first real cold weather raincoat! Are you a dog lover who writes about dogs? PAWSit Hop Saturday is the place to share the links to your published dog-related articles and blog posts! The link-up runs from week to week so stop by anytime to add your link. We wish our loved ones a Happy Thanksgiving. Make 2018 a year of giving thanks for that which you are given and a year of giving to others, so they may do the same. I give thanks for two blessings of invitations to spend this holiday sharing good food and friendship with families near and dear to me. However, I chose to spend this Thanksgiving Day at home (but not alone) with my dog Valentino. Why? you may ask. Because my dog Valentino has been my best friend and closest-to-my-heart family member every day of the past three years. Thankfully, for this holiday I shared good food and good friendship with a dear family--my church family! Hope United Methodist Church had their yearly Thanksgiving gathering on the Sunday before Thanksgiving. I was a guest at the table of my work family in the midst of this fellowship gathering of faithfulness. I trust that you have something for which to give thanks. 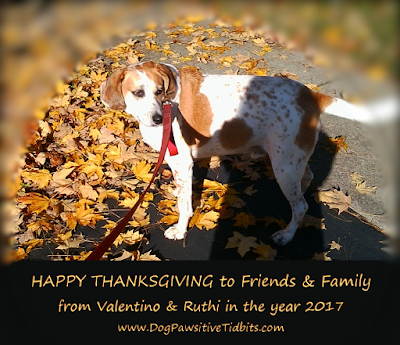 I trust that you shall share a tidbit of thankfulness within your comment for Me and V here at Dog Pawsitive Tidbits today. We thank you! November 11th is Veterans Day in the USA. My dog Valentino is here to remind you...Lest you forget. Here in Canal Winchester, Ohio, vets and widows and widowers of vets who lost their lives in service of our country have already enjoyed a pancake breakfast at the community center. Now a ceremonial march through downtown is about to begin. Lest we forget...Thank you, Vets! 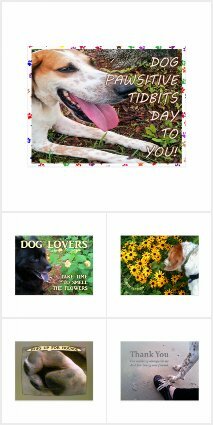 As a Zazzle designer I may earn additional income through purchases made via links in this article. Thank you! 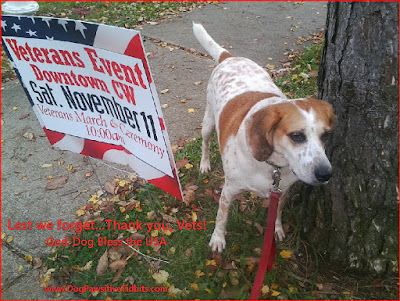 Add the links to your VETERANS DAY and DOG-RELATED articles below and we will be around this weekend to visit and social share them. Beautiful Joe was a real dog. He was a lowly cur—mixed breed, mongrel, mutt—abused then rescued. He lived the rest of his years loved and happy in Meaford, Ontario, Canada. The beautiful thing about Joe is his legacy. BEAUTIFUL JOE is the dog's story, as told by the dog himself. Published in 1894, the book gave voice to the dog, as written by author Marshall Saunders. The tale of the dog also gave voice to the author and her mission, Beautiful Joe's legacy. In fact, in his autobiography Beautiful Joe tells us of his rescue mistress, Miss Laura, "I love her better than anyone else in the world; and I think it would please her if I write the story of a dog's life. She loves dumb animals, and it always grieves her to see them treated cruelly." Margaret Marshall Saunders was an animal rights advocate as well as an author. In 1889, a time when dogs and other animals were thought of as "beasts of burden" and "dumb animals" Saunders submitted her story of Beautiful Joe to an American Humane Society "Kind and Cruel Treatment of Domestic Animals and Birds in the Northern States" competition. Her submission won her the prize of $200. 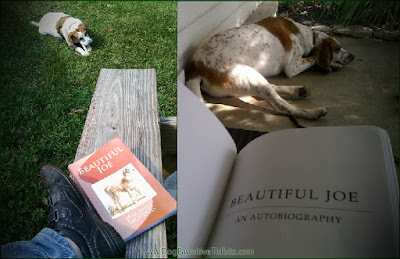 In this, my second reading of BEAUTIFUL JOE for this book review, I read it aloud to my rescue dog Valentino. We enjoyed a few hours sunning ourselves at the picnic table or cooling ourselves in the shade of the front porch while enjoying the stories from Joe and Saunders. It was time well-spent together. The stories in the book touched my heart in so many good ways and in a few not-so-good ways. Each story comes with a life lesson of its own to be learned. I would love to share them all with you. Alas! I can not. You simply must buy BEAUTIFUL JOE and read it for yourself! Note: As an Amazon Associate, I may earn through purchases made via links to Amazon in this article. Thank you for supporting Dog Pawsitive Tidbits. I have not had the pleasure of visiting the park in Meaford, Ontario to see its dedication to Beautiful Joe and Saunders. I hope one day I will have the chance to do so. For now, I am appreciative of those who have and share their time and photos of Beautiful Joe Park. I imagine me and my rescue dog Valentino walking those sacred grounds together. We may even meet up with our Canadian friend Susan and her dog Maggie! PAWSit Hop Saturday is a link-up opportunity for those of you who are publishing articles which are dog-related. Feel free to add your links anytime throughout the week. A new PAWSit post is added each Saturday for your promotional convenience. Yes! I do promote all links shared in various social sites. Get the InLinkz code for your article. Oftentimes dog rescues inspire poetry or tail wags. Or both, as is the case for me and my dog Valentino. 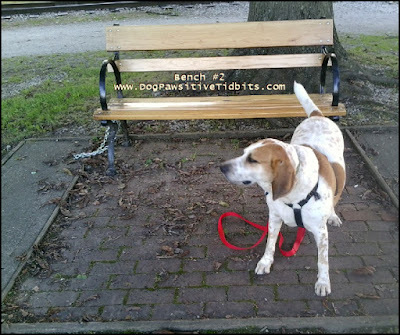 Last week my PAWSit post shared three pictures of my dog near empty benches. Bench number three tugged at my poetic heart strings! Thus, it was the first of the bench images to be used by me as poetic inspiration. My first attempt at a Blues Poem is dedicated to one of our dearest friends. My wee bit of rhyme is followed by a tail wag of thanks to her from "our dog" Valentino. An empty bench is not a victimless crime. Come sit with me for a tidbit of time. 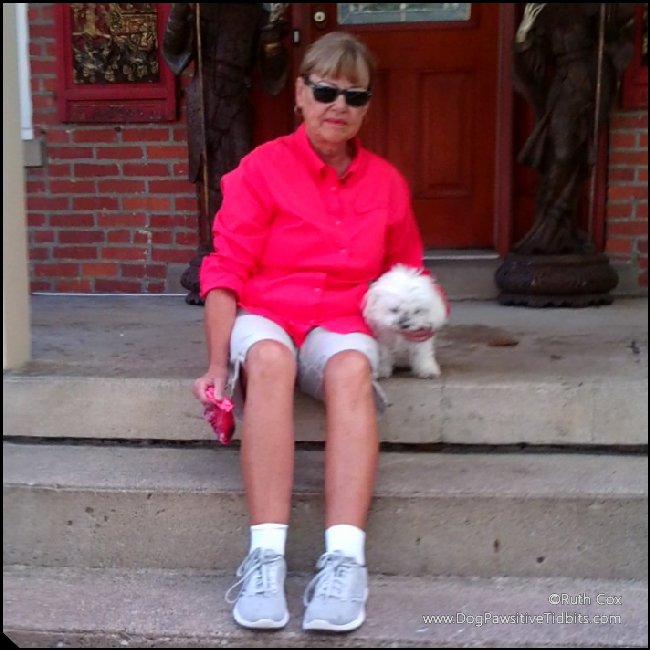 Ruth Cox of Dog Pawsitive Tidbits is a participant in the Amazon Services LLC Associates Program, an affiliate advertising program designed to provide a means for sites to earn advertising fees by advertising and linking to Amazon. If you are publishing anything about dogs we invite you to come PAWSit with us. Just click the ADD YOUR LINK button below to share your dog-related articles. Me and V will follow your link to read your thoughts and if we like what we see we will share it on social networking sites! I consider finding a praying mantis quite a treat. But not one for the dog to eat! 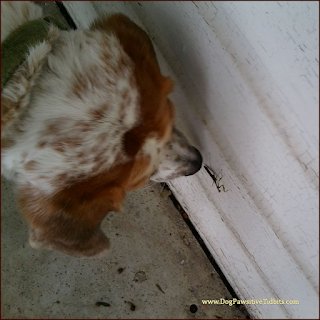 My great hunter of a dog, Valentino, set his nose upon a small creature crawling up a tree. My dog looked at the critter with a quizzical expression as if to say, "Why, you don't even smell edible!" I had no doubt the mantis was scurrying up that tree trunk as fast as its legs could carry it. Wouldn't you do the same with the nose of a great big creature sniffing at you? But of course, the poor thing couldn't move very quickly. It looked as though it was missing a leg or two. 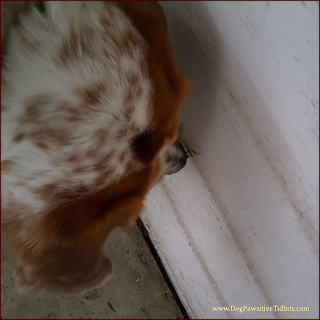 And too, the dog really should keep his nose out of the critter's way, as he might get a stinging bite from the mantis insect! While intrigued by my dog's interest in the praying mantis, I thought of a wee prayer poem for the pair. I snapped a couple of pictures of dog and mantis to go with the thoughts in my head. Valentino and I finished our walk and we returned home. Inspired, I immediately went to work creating the latest addition to my collection of Dog Pawsitive Tidbits plaques—a praying mantis sure to be a treat for dog lovers! Obviously, the book "All Creatures Great and Small" by James Herriot (animal doctor) came to mind as I designed. For those of you who have not yet read this book I have included the link to it as well as a few of the author's other bestsellers. As an Associate of Amazon and of Zazzle I may earn through purchases made via links in this article. Thank you for supporting Dog Pawsitive Tidbits! Pause for a tidbit of time to sit with me and my dog. Perhaps you and I can read and write together while my dog rests his weary paws. We have walked for quite some time. Yes, my dog Valentino and I have been strolling around the neighborhood, the dog park too. We found several benches upon which to sit. 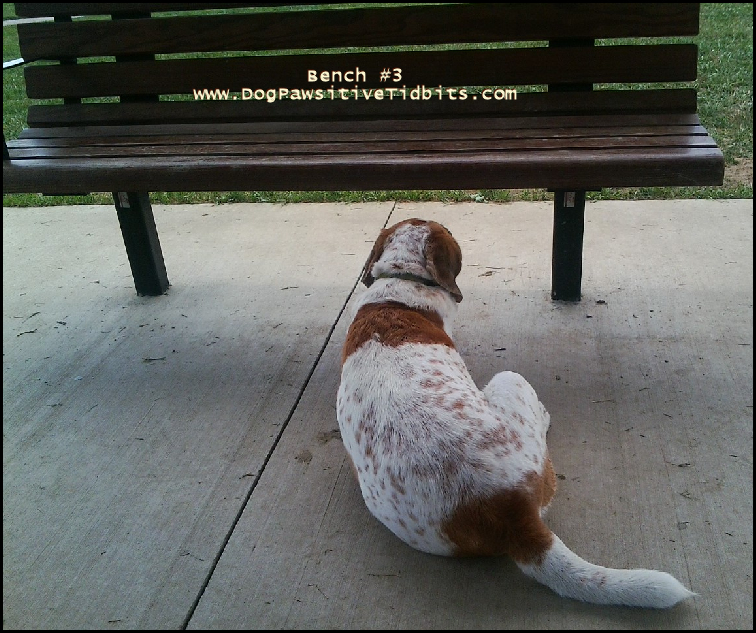 Alas, each bench is empty! Ah! but we have an empty bench remedy in mind! But of course, we will need your help for this task. 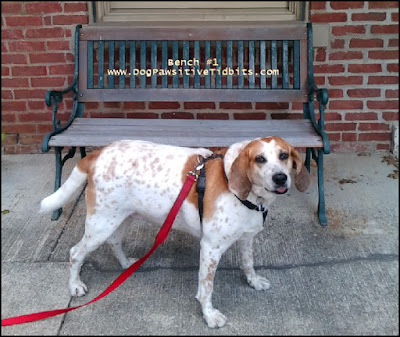 So, pick a bench and sit for a bit while we explain what we want you to do. Canal Winchester Area Historical Society. Select one of our bench photos for inspiration. 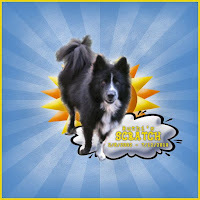 If you use our photo in your article, please link it to www.dogpawsitivetidbits.com. Write a dog tale, dog poems, or dog-related product or book review. ADD YOUR LINK to your article to the linky list at the end of this blog post. Please leave paw prints in the comment section for Valentino. As an Amazon Associate I may earn via sales made through links in this article. Thank you for supporting Dog Pawsitive Tidbits. We invite you to add your dog-related article links anytime throughout the week. Check back for our new link-up every Saturday! And please visit all of the contributors to PAWSitive Hop Saturday each week. My dog Valentino pauses to hear musical wind chimes. Valentino's pause from our dog walking was just long enough for me to capture a few seconds of the sound of serenity coming from the limbs of an old tree. But of course, that pause was short-lived and his paws hit the pavement in search of other things. That was fine with me. I consider strolling along with my dog an exercise in serenity-seeking for both of us — no matter where our feet may lead. 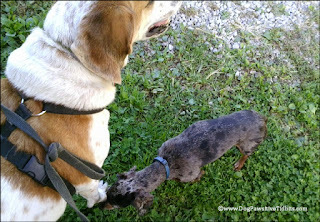 Valentino is generally more interested in sniffing for the smell of animals that came before us on our pathway. For me, tranquility is found in the walk itself. 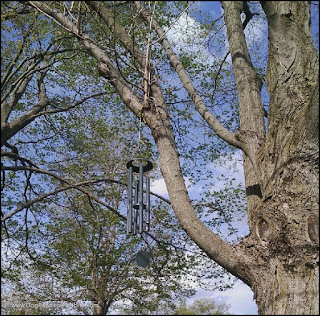 Spring and Autumn seasons seem best for stirring music in the trees and on front porches of our neighborhood. 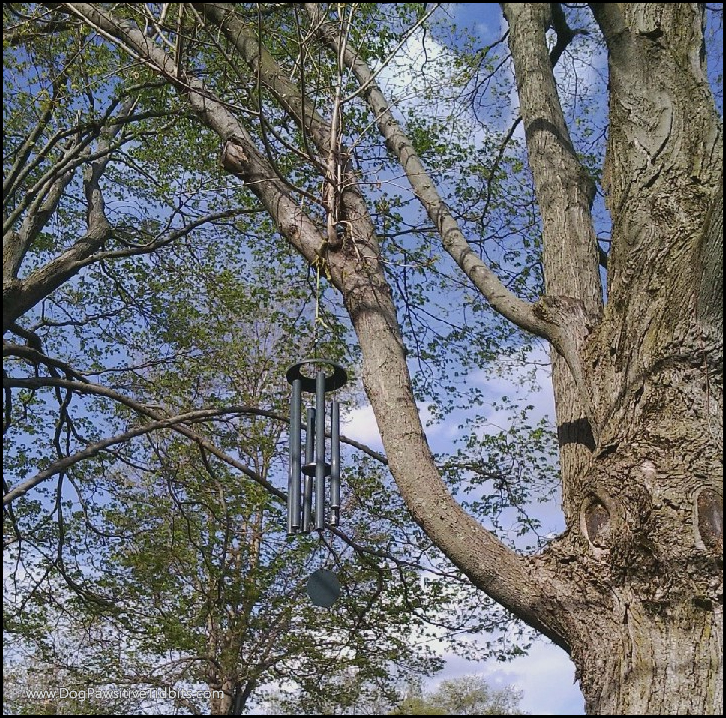 As these seasonal winds blow, our sidewalk stroll is alive with the gentle sound of music from wind chimes filling the air. Ah! the sight and sounds of serenity! A walk in the neighborhood with my dog Valentino by my side, the air we breathe filled with the sight and sound of musical wind chimes, serenity sought and found — who could ask for anything more? 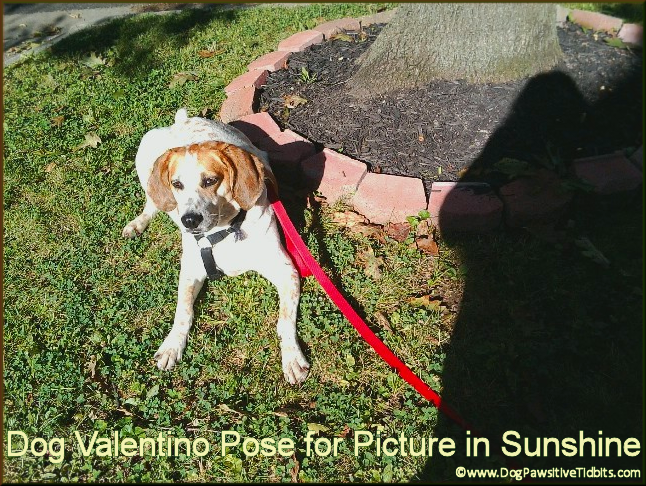 My dog Valentino and I would like to invite you to become a part of our net neighborhood! We are working at building our PAWSit Hop Saturday dog blog hop. Take a walk with us this week! All you need to do is publish an article that is dog-related, then add your link to the blog hop list provided below. This list runs all the way through to next Saturday so you have plenty of time to write and share as many dog articles as you wish. A new link-up list is created each week. Hop along with us and tell all your friends who are dog lovers about us too. Most dog lovers make good neighbors, a treat in and of itself. My dog Valentino and I are fortunate to live in a neighborhood where great neighbors, dog lovers, and dog pals are plentiful. We consider it a treat to live in such a dog-friendly community. But of course, not a thing pleases Valentino more than a package of dog treats left on our front porch just for him! 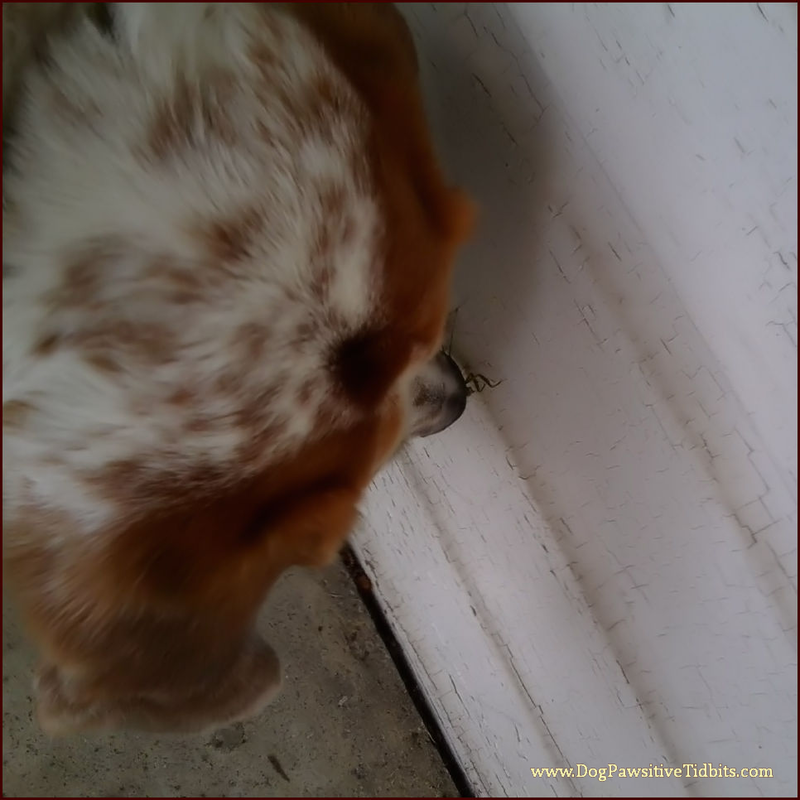 Occasionally I will open the front door and there on the porch is a treat for my dog from a neighborly dog lover. 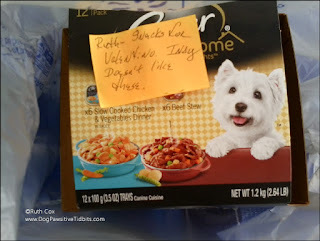 This week the package included a note: "Ruth- Snacks for Valentino. Indy doesn't like these." I assured my good neighbor that my dog Valentino enjoyed the Cesar dog dinners that her dog Indy did not like. Valentino had one of the meals as a stand alone snack. He ate the rest of them mixed in with his dry food each day until gone. There are times when dog treats left on the porch for Valentino are bittersweet gifts. 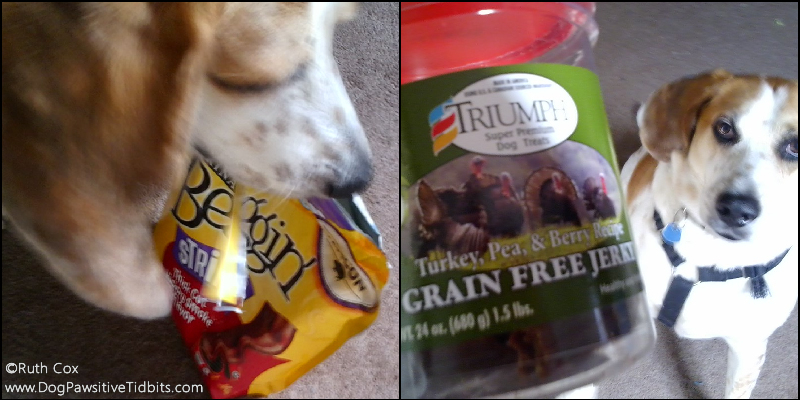 That was the case when I found a bag of Beggin' Strips and a container of Grain Free Jerky on the porch. I knew instantly they were from my neighbors next door. Their dog Albus was accidentally killed by a hit and run driver the day before. Valentino misses his dog park pal. And I miss the handsome face of Albus greeting me on a daily basis. Each time I give Valentino one of these treats I say, "Thank you, Albus." While Valentino enjoys his treats, I recall that sad moment when our friends lost their dog. As an Amazon Associate I may earn commission for purchases made via links in this article. Thank you for supporting Dog Pawsitive Tidbits. We would like to hear from all of our friends who are good neighbors and dog lovers. 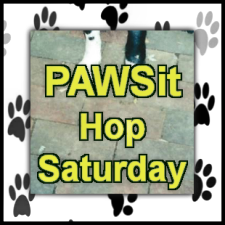 We will consider it a great treat to have you join us this week in our PAWSit Hop Saturday dog blog hop. Valentino is a flag waving tail wagging dog. In all probability my dog gets his political views from my guidance and direction. I am not one to get overly excited about politics nor do I consider myself extremely patriotic. 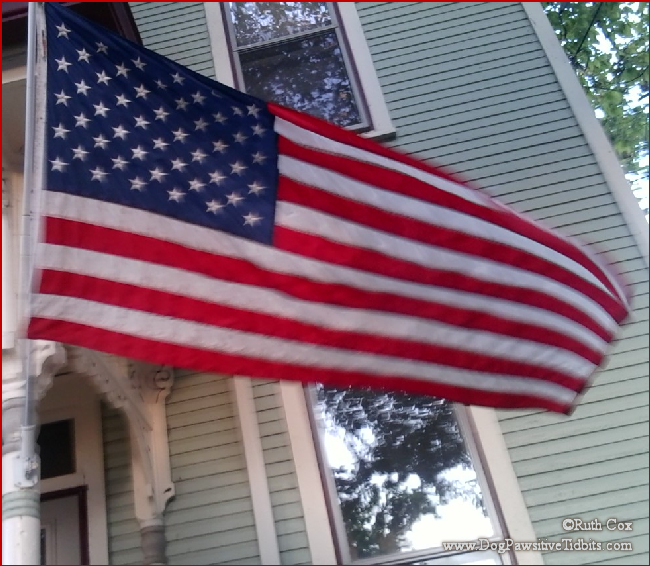 However, as a citizen of the United States of America, I take pride in the sight of our flag and in the singing of our national anthem. Then, there is the "stand versus kneel" issue in the daily news and social media! Hence, this public stance from me and my dog Valentino. We stand! We do not kneel nor sit! 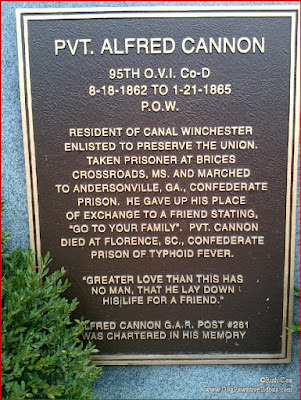 My research shows that Alfred Cannon was born right here in my home town of Canal Winchester, Ohio. CLICK HERE to read more about his family and service to his country. This memorial to PVT. 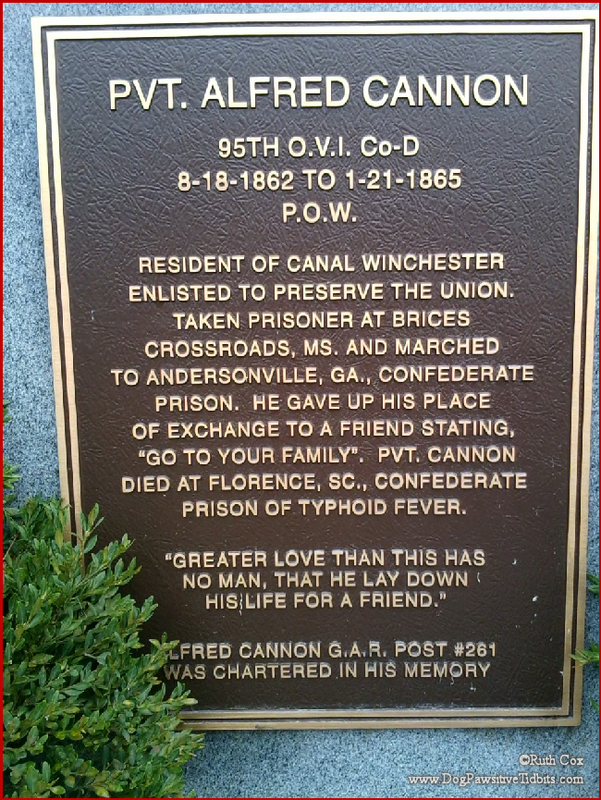 Alfred Cannon is located on the Canal Winchester Area Historical Society property. You can click on the picture to read the tribute and I am also reprinting the words as a quote below the photo. ENLISTED TO PRESERVE THE UNION. HIS LIFE FOR A FRIEND." I tend to take a stand when I see disrespect to the flag of my country. It has nothing to do with politics or football or racism or anything else the kneelers or the politicians or the news-mongers want to dream up. It is merely a matter of respect. I feel the same about our Star Spangled Banner and the Pledge of Allegiance to our flag. I say to you as I said to my dog today, "I don't expect you to sing it or say it but I do expect you to stand respectfully." That said, I appreciate your shared thoughts in the comment section of this article, stated respectfully, Please and Thank you! As an Amazon associate I may earn commission for sales via links in this article. Thank you for supporting Dog Pawsitive Tidbits. 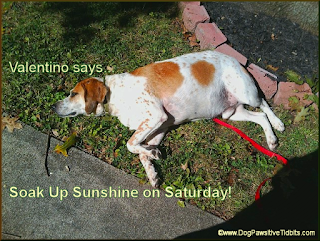 PAWSit Hop Saturday is a dog blog hop and we invite our readers to join us each week. When you publish an article about dogs share the link to your article in the link-up below. The current link list is good for a week, so you have plenty of time to blog about your dogs, dog issues, dog toys, dog training — anything dog-related! I love Fall and so does my dog. 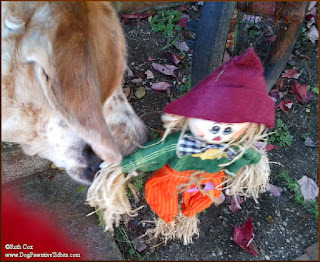 Throughout the Autumn season, my dog Valentino and I enjoy the seasonal fare to be found during our walks in the neighborhood. Pumpkins are plentiful! 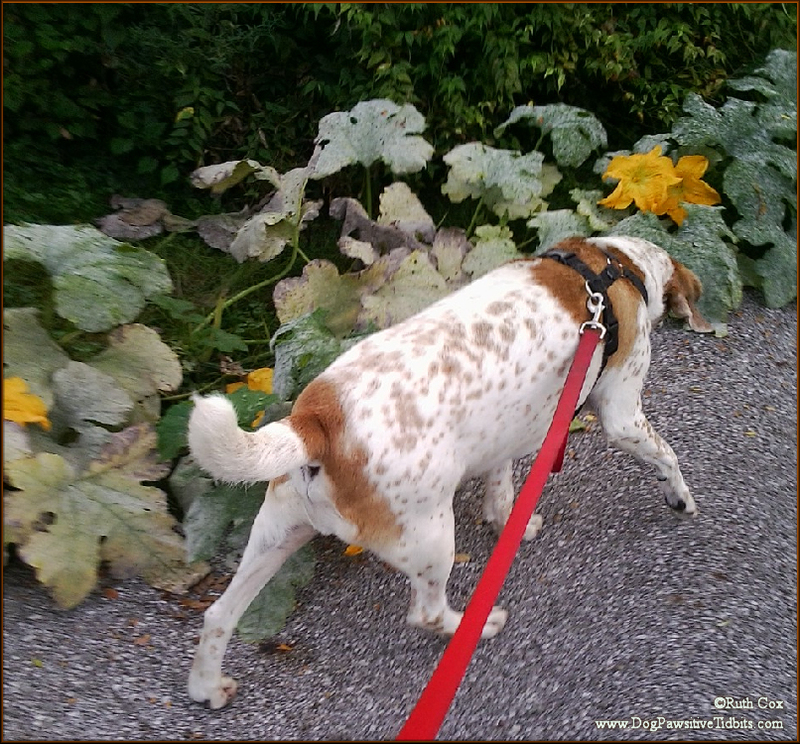 In our neighborhood the pumpkins are beginning to pop up along our way and Valentino stops to sniff each one of them. Perhaps he hopes they are edible! Pumpkins abound, whether found on the ground in a pumpkin patch or as flower pots with painted faces holding colorful flowers for the season. 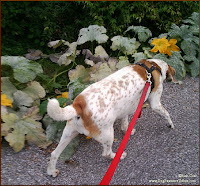 My dog Valentino did find a pumpkin in this pumpkin patch which you can see and read about HERE in my seasonal dog treats article. 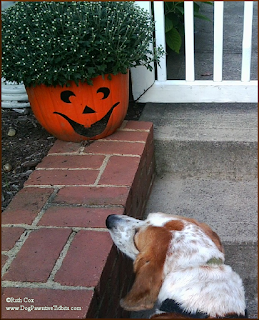 Dogs as well as kids of all ages enjoy pumpkins in the Fall season. 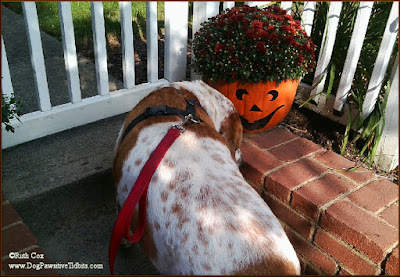 There are many uses for decorative pumpkins. Fall flower pots with PAWSitively perfect painted faces are great for mums and other Autumnal flowers. 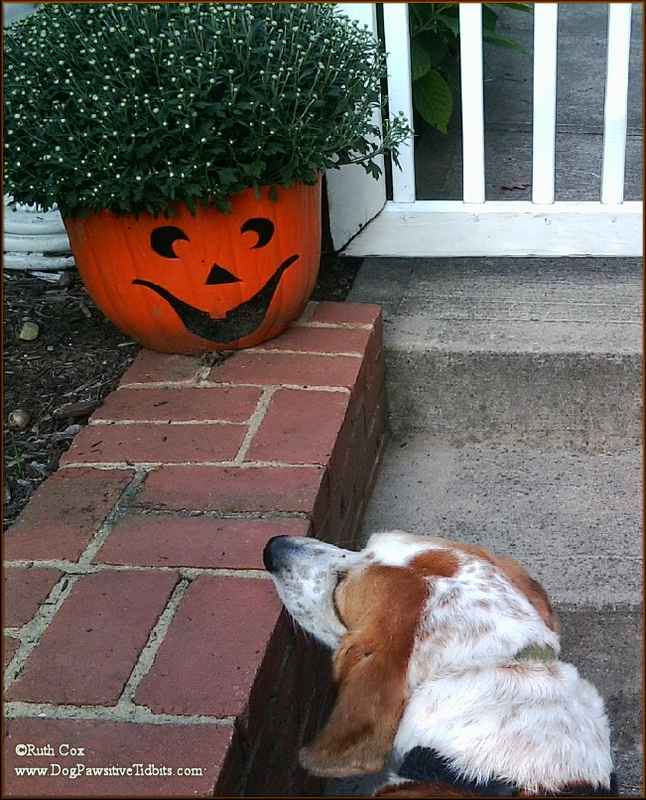 Some pumpkin faces light up our path from house to house in the neighborhood. Pumpkins make great candy holders for trick-or-treaters and for those of us who hand out candy to the wee ones for Halloween. As an Amazon associate and Zazzle designer I may earn commission for sales via links in this article. Thank you for supporting Dog Pawsitive Tidbits. Will you be using pumpkins and scarecrows in your seasonal festivities? Or, are you the ghost and goblin type of dog person? Me? I am more likely to be dressed as a witchy woman for Halloween! 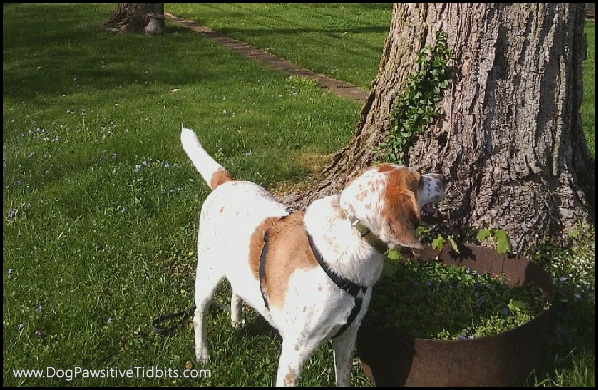 PAWSit Hop Saturday is a weekly link-up for you to share your dogs and articles about dogs. Add your link anytime throughout the week. Paws Up for a Happy Fall! We found a lost Dachshund on our afternoon walk. My hound dog Valentino sniffed out the wanderlust with ease. Since I pay attention to all of the dogs we run across on our neighborhood walks, I was pretty sure I knew the house where this little fellow belonged. Many a time we had seen a pair of barking Dachshunds with noses to the window of a house as we walked by. We headed off in the direction of the house just a couple of blocks from where we found the dog. Fortunately, the dog willingly followed Valentino's lead and we were able to walk him home to try to reunite the dog with his owner. 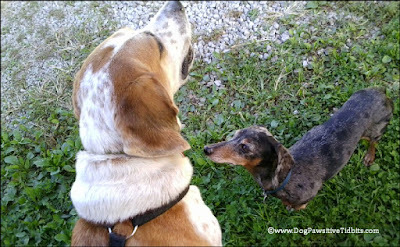 I knocked on the door while Valentino and the Dachshund got to know each other a bit while we waited for someone to answer. I barely had time to snap a picture of the dogs, big and small...but oh, how cute! Once the owner opened his door in response to my knock, my dog Valentino stuck his nose in the air and began his hound dog howl. I had to chuckle and say, "I think he's giving your little dog a lecture!" The man laughed and said, "He's an escape artist and must have found a way out of the fenced yard that I had not yet found." The man thanked us for returning his dog and we headed home ourselves. Valentino and I had had enough excitement on this afternoon dog walking adventure. Once again, our good dog deed for the day was done! Yes, we have reunited a few dogs with their owners in the neighborhood. Fortunately, some dogs wear a dog tag with a name and number to call if they run astray and are found. This brindle boxer, for instance. We have a few dog pawsitive tidbits to share with you for what to do if you find a dog running loose when you are out and about. First, know the dogs in your neighborhood. Pay attention as you stroll the area so if you find a dog you might know where it belongs. Approach stray dogs with caution. The dog may be frightened and run away or bite. If the dog is friendly and lets you near enough, check its dog tag if it is wearing one. The dog owner may have the dog's name on the tag or the owner's name or number to call. If you know where the dog lives, try to walk it home. When all else fails, contact your local animal shelters and area veterinarians for further support in an effort to reunite the dog and its owner. Do you have any tips to share for a lost and found dog scenario? Have you ever found a lost dog? Were you able to reunite the dog with its owner? We invite you to join us for PAWSit Hop Saturday. Share the DOG tales you publish throughout the week. Just click the ADD YOUR LINK button below to do so. 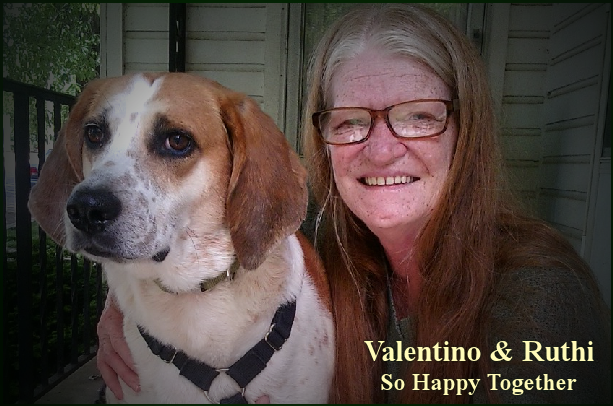 Valentino and I will walk right over to your web site for a visit when you do! Get the blog hop code for your article. The slightest movement catches the attention of dogs. And the chase is on! His leash attached to the railing did not keep my dog Valentino from chasing the critter — it was right there on the front porch with us! 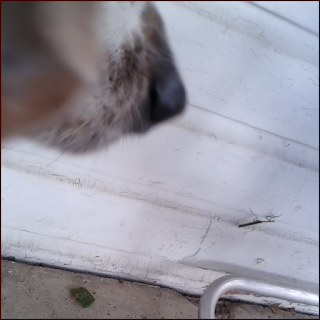 Led by his keen eye and nosy nose, Valentino moved my chair out of his way to get an up close and personal look at the creepy crawly critter that had grabbed his attention. Of course, my dog's activity caught my attention so I had to take a closer look too. Luckily I had cell phone camera in hand as I screeched the "ACK!" command that my dog and I had worked diligently on in our dog training. Good boy that he is... Valentino backed off just enough for me to click and capture a pic of the Walking Stick bug! As the insect creepily crawled himself up the wall of the house, my dog Valentino and I watched from a safe distance. I had already pushed the safety limits by spending those few moments getting these pictures. Upon my own sighting of one of these critters a couple of weeks ago, I did a tidbit of research and learned that stick insects can sometimes emit a foul-smelling spray that can temporarily blind a predator. I sure did not want this happening to my dog. Visit my poetry blog for more stick bug photo fun and to read my Walking Sticks poem. Visit the National Wildlife Federation for a few fast facts on Walking Sticks insects. What are your pets sticking their noses into these days? Write about it. Then share it with us by adding the link to our not-so-wordless Wednesday blog hop! I have loved and lost a few good dogs. No doubt this is something I will experience again. As a dog lover I can not imagine living without a dog by my side. Today, September 10, is National Pet Memorial Day. This day is set aside to honor the memory of our past pets and animals. 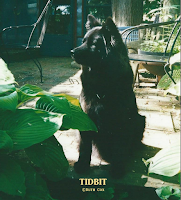 I thought of writing, yet another, tribute tale of the special dogs of my past. 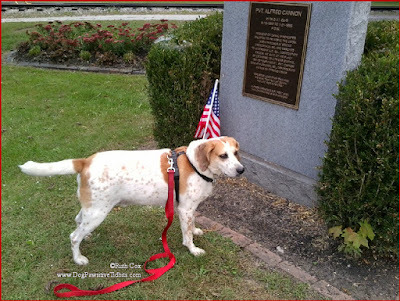 I decided against doing so, as I have shared our stories in abundance on this blog, so named for them which you can learn by reading about Dog Pawsitive Tidbits. I have something more important I want to share with you today. 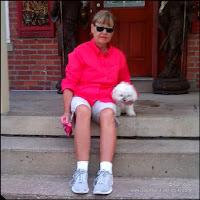 My memorial message for pet and dog lovers deals with loving and being loved by them. To me, there is no greater love than that of my dogs. I am honored to know that loving relationship like none other. Each time life chooses to allow me to out-live my dog I am led to the next dog who will leave its paw prints on my heart. While losing one of my dogs is emotionally devastating, I would have it no other way. The flip side would be my demise and knowing they would suffer the tragic loss of the leader of their pack. However, there is a way to deal with that scenario ahead of time, just as I have with the aid of the book "If I Should Die Before My Dog" by Joe and Cathy Connolly. When you find yourself suffering the loss of a pet, allow that pet's love to lead the way to the next animal companion of your life. My dog Tidbit led me straight to my current canine companion, Valentino. I walked him a few times at the shelter, then he was my foster dog for a while. It took only a tidbit of time for me and my boy to become ever so happy together ... we adopted each other! Tidbit led the way to the next dog who would steal my heart away. Have no regrets ... just love of pets! 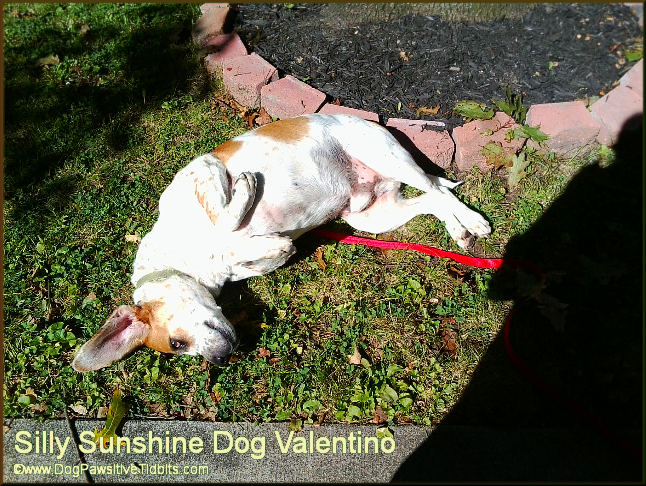 My dog Valentino loves soaking up sunshine! We decided to share our sunshine with you in a PAWSit post today. Yes! 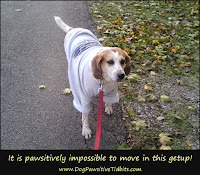 PAWSit Hop Saturday is officially returning to Dog Pawsitive Tidbits! Due to a major move and a few other life things our weekly dog blog hop was put on the back burner for a tidbit of time. Now that we are settled in and back to blogging on a regular basis again we decided it time we revive our PAWSit Hop Saturday fun. For the last couple of days, near the end of our dog walk, Valentino will pause to soak up a bit of sunshine in the same spot at the base of a neighbor's tree. He sits for a bit, rolls around in silly dog fashion, then settles in to just lay there in the sun for a while. 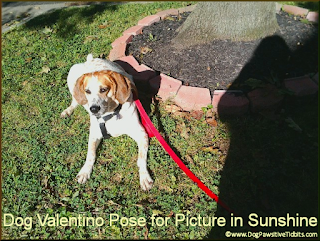 Valentino will pose for pictures while soakin' up a bit o' sunshine, but no matter how much I tug on his leash or beckon him to get up and go he will not move until he is doggone good and ready! We invite you to share your dogs with us! 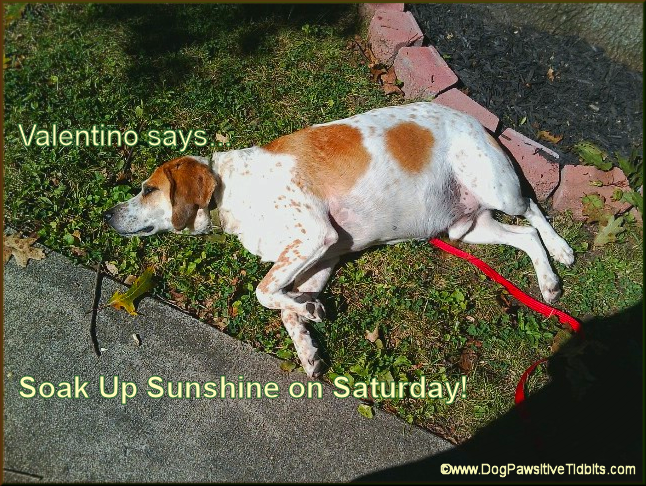 Join us each week by adding the links to your dog articles to our PAWSit Hop Saturday link-up. Just click on the "Add Your Link" button below to share. 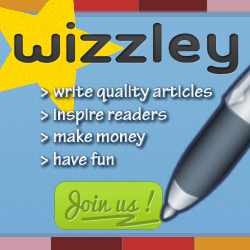 If you like, snag our badge for your article and link back to our weekly post where you've added your link. 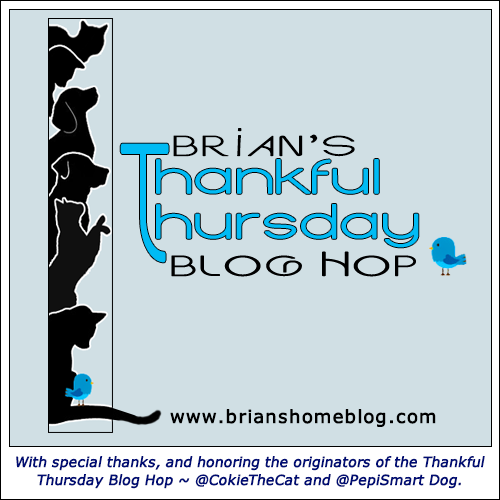 This enables other dog lovers to find the dog blog hop. This is a dog blog hop! Freedom rings true for my dog off leash. 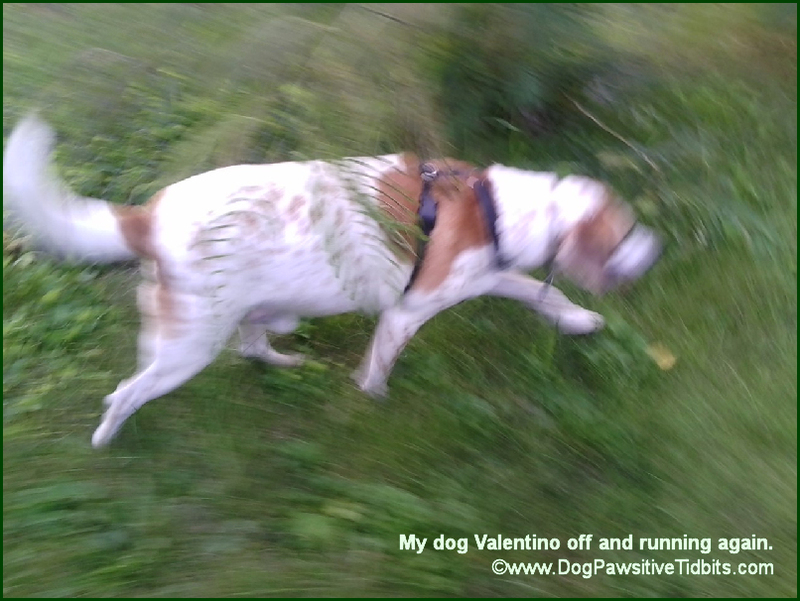 I can almost hear the bells of freedom ringing in the breeze as my dog Valentino runs swiftly by me. Today, we hum a tune of gratitude for our neighborly friend who has opened the gate to his fenced yard, to allow Valentino to run free. Being able to run off the leash is the truest sense of freedom for dogs. I think the only thing that might make him happier would be to do so without being fenced in. This truth is obvious when he runs his first freedom lap through the yard and then begins to check out the fence line for any possibility of escape. He does the same thing in any fenced yard and at the dog park. My dog Valentino runs free, checks the fence, then runs some more! Above all, my dog Valentino shows gratitude for our new friend, Patrick, who made this off-leash freedom run possible. 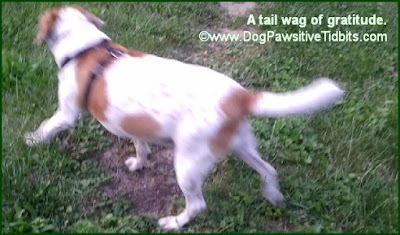 He slows his running paws nearby as he wags his tail in appreciation. Ah! the joy of freedom and friendship, if only for a tidbit of time! 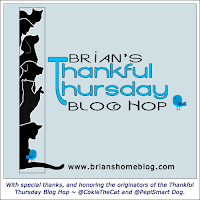 Today we are blog hopping along with our new net friends over at Brian's Home in his Thankful Thursday blog hop. Need a link list tool? Here you go!